My interest in bartending and crafting exquisite cocktails emerged back in 2009, and has progressively grown greater and greater every year. The experience I’ve compiled from the many service industry titles I’ve carried since then have immensely attributed to my food and beverage knowledge today.To me, the amount of artistry that comes with this profession is truly admirable, not only to the devoted people who also serve in the industry, but to the consumer as well. 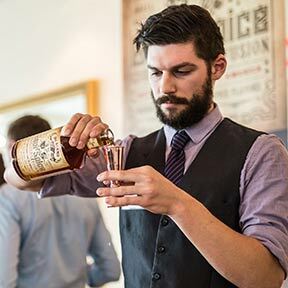 With large levels of collaboration between bartenders, chefs, restaurant owners, even distillers and more, one can learn and concoct such cutting-edge thoughts, feeding off others and forming an exciting, flourishing community. I’ve always worked resiliently at my techniques. By taking the work I do home, it gives for more time and a better understanding of what is to come next, and how to improve on it, break it down, start over, try again, hopefully reaching the ultimate goal. Perfection. The chemistry behind making new cocktails will forever grow more intense. That’s what will push bartenders such as myself to surprise you with an unseasoned, exciting libation.Gaur Spiced Whiskey has emerged strong and a changing the way we create. This spirit provides a uniquely complex flavor profile to a cocktail that you most likely have yet procured. As a seasoned bartender, it’s absolutely astounding to see how Gaur has created such a tasteful whiskey that is both delectable to enjoy on its own, and also proved itself as a spectacular base spirit in modern mixology.